One of the late Sen. Ted Kennedy’s (D-MA) last legislative fights was about the overuse of livestock antibiotics. “It seems scarcely believable that these precious medications could be fed by the ton to chickens and pigs,” he wrote in a bill called the Preservation of Antibiotics for Medical Treatment Act of 2007 (PAMTA). Over 70 percent of antibiotics go to livestock, not to people, said the PAMTA bill, a figure the drug industry refutes. “These precious drugs aren’t even used to treat sick animals. They are used to fatten pigs and speed the growth of chickens. The result of this rampant overuse is clear: meat contaminated with drug-resistant bacteria sits on supermarket shelves all over America,” said Kennedy. This week the Centers for Disease Control and Prevention has declared to be “Get Smart About Antibiotics Week” and is meeting with a coalition of 25 health organizations to address overuse of antibiotics. Excessive use of antibiotics in livestock operations and health care settings creates “superbugs” which no longer succumb to the antibiotics which once destroyed them. Anyone who has rented an apartment which has both an exterminator and bugs has firsthand experience with the principle of antibiotic resistance. Organisms can become impervious to what is supposed to kill them and bigger and stronger. Resistant mosquitoes, it is said, when you slap them, they slap you back. Still, most health professionals agree that the use of antibiotics in livestock operations is the biggest source of resistance. The pills are used to make animals grow faster and keep infections from erupting in the crowded, “factory” conditions and they do not appear on food labels. Efforts by medical organizations and the FDA to curtail farm use of antibiotics have gone nowhere even though they include the same drugs needed to treat urinary tract, intestinal, respiratory, ear and skin infections in humans, not to mention TB and STDs. 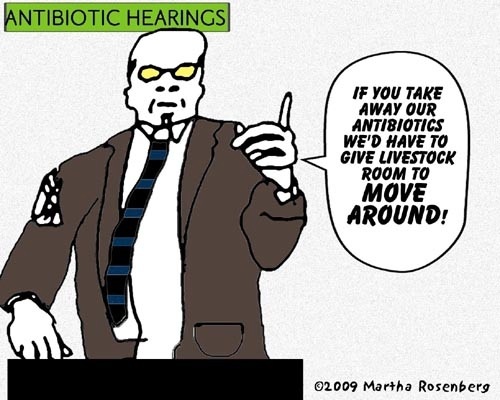 Livestock antibiotics are a big source of revenue for Big Pharma. Thanks to the overuse of antibiotics, MRSA, (Methicillin-resistant Staphylococcus aureus infections) kills 20,000 people a year and Clostridium difficile, a serious intestinal bug is developing resistance. Resistant Acinetobacter baumannii so afflicted US troops in Iraq it was dubbed “Iraqibacter,” and Vancomycin-resistant enterococci (VRE) has developed because of the use of the antibiotics virginiamycin and Avoparcin in livestock. VRE infections have been reported in 33 states and in commercial chicken feed, reported the Hartford Advocate. And there is another worry. “Overuse of antibiotics could be fuelling the dramatic increase in conditions such as obesity, type 1 diabetes, inflammatory bowel disease, allergies and asthma, which have more than doubled in many populations,” writes Martin Blaser, professor of microbiology at New York University’s Langone Medical Center in the journal Nature. “Indeed, large studies we performed have found that people without the bacterium are more likely to develop asthma, hay fever or skin allergies in childhood,” writes Blaser. As H. pylori, one bacterium, “has disappeared from people’s stomachs, there has been an increase in gastroesophageal reflux, and its attendant problems such as Barrett’s oesophagus and oesophageal cancer. Could the trends be linked? “writes Blaser. The proton pump inhibitors such as Prilosec, Prevacid and Protonix makes matters worse–altering the composition and capacity of bacteria in the colon, researchers report. Because of their links to resistant infections and possibly obesity, asthma and gastrointestinal problems, it is good to see health professionals curtail the use of antibiotics. When will livestock operators follow suit? This article was posted on Friday, November 16th, 2012 at 8:00am and is filed under Agriculture, Health/Medical, Life/Animal Rights, Pharmaceuticals.